As a “Preferred” Elitewood dealer, Ultra Patios can offer both our “Ultra-Series” and “Classic-Series” patio covers. Your outstanding sales history has earned your company this preferred dealer status. This is a special honor that is not extended to all of our dealers. 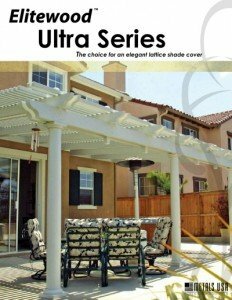 As you are well aware of by now, the “Ultra-Series” patio cover featuring a Valspar Kynar-500 advanced coating system is the highest quality patio cover product on the market. Our “Ultra-Series” Lifetime Warranty is the strongest in the industry which includes a 30-year Non-Proration period, 10-year Labor Reimbursement and most of all, a warranty that covers Chalking and Fading. “Ultra-Series” is the ultimate maintenance-free aluminum patio cover available anywhere! You and your entire organization deserve to be very proud of this accomplishment. Metals Building Products is very fortunate to have a first class operation such as Ultra Patios representing our fine line of high quality patio products. Keep up the outstanding work and let’s make 2016 another year of excellent sales and unsurpassed installation performance from Ultra Patios.